In Egypt, Rare Police Brutality Trial Draws Scrutiny The policemen are accused of beating an Internet cafe customer to death after he refused to show them his ID. The case has attracted attention from Egyptians fed up with living in what they describe as a police state. Activists carry a poster with pictures of Khaled Said during an anti-government protest in Cairo, Egypt, on June 20. Said was allegedly beaten to death by two plainclothes policemen on an Alexandria street. The trial of two policemen charged in the death of a man whose case has captured widespread international attention begins Tuesday in Egypt. Prosecution of police officers is rare in the country, where security forces for decades have enjoyed broad powers and acted with impunity under President Hosni Mubarak. But many government critics and human rights activists say this case could prove a turning point and help end what they describe as a deeply rooted culture of police brutality. Some 100 protesters gathered recently outside of the Supreme Court in Cairo to mark the 40th day since the death of Khaled Said. Witnesses say two plainclothes policemen dragged away the 28-year-old man from an Internet cafe in the northern city of Alexandria on June 6 after he refused to show them his identification. The witnesses say they dared not interfere as they watched the officers repeatedly slam Said's head into nearby stone steps until he was dead. 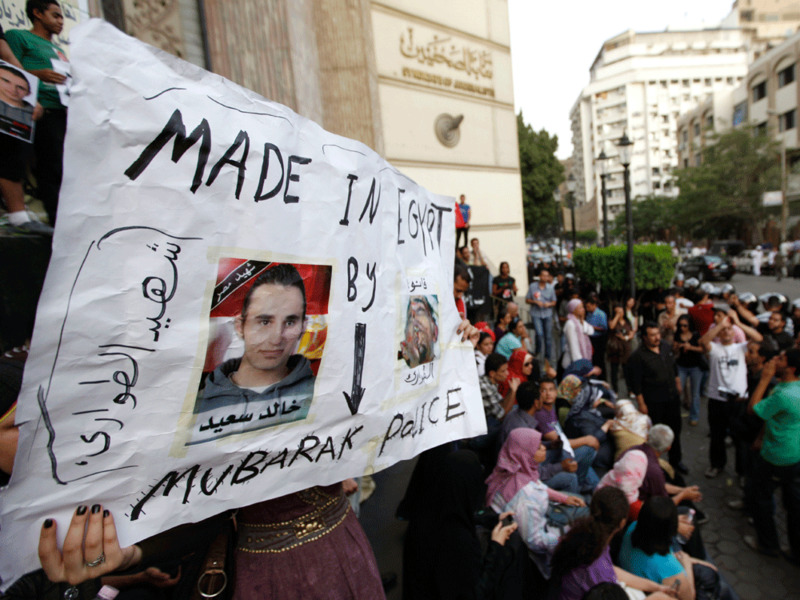 In Cairo, the protesters shouted about police abuse and injustice. They handed out fliers and tweeted from their cell phones. Stern-looking police officers in armored vests surrounded them. The show of force was intimidating and most passersby steered clear. But the small demonstration was allowed to continue. Protestor Mohammad Wakid thinks that's because officials hope to minimize public reaction. "It's up to them to decide which cost they want to bear, you know?" Wakid said. "For that crowd, it will be -- in my opinion -- the cost will be 20 times bigger when there are arrests." The Interior Ministry, which oversees the police, declined to be interviewed by deadline for this story. But the police response highlights the sensitivity surrounding the case. Adding to the pressure was a statement issued by European Union officials expressing concern about the circumstances surrounding Said's death. "Every family in Egypt has a story of its young members being stopped and searched or asked for identification cards arbitrarily by the police," said Hossam Bahgat, who heads the Egyptian Initiative for Personal Rights. "The fact that such a routine practice could actually lead to the death of the person being stopped was particularly shocking to families." Public backlash grew after the Interior Ministry claimed Said was a drug user who choked to death on a packet of marijuana found in his throat. But many people believe police put it there. Witnesses say police took Said away after he died, and returned a short while later and dumped the body. With the Egyptian government weakened by economic woes and lingering rumors about Mubarak's poor health, many hope the case will help bring about improved police accountability. Some senior Egyptian officials, including Mubarak's son, have spoken out against the officers. Still, there seem to be limits as to how far the Egyptian government is willing to go. For example, the officers going on trial in Alexandria are not charged with murder or wrongful death. They are instead accused of using excessive force and illegally arresting Said. Government critics complain that police brutality continues unabated. Aida Seif el Dawla, a university professor who heads a group dealing with Egyptian victims of torture, cites a half-dozen alleged incidents in the weeks following Said's death, including a man who was thrown out of a third-story window of a police building. "That is in one month, so there is absolutely no change," she said. "As a matter of fact, if I look at it from a distance, I'd say the Ministry of Interior is telling everybody, 'Well, we don't care, OK? We just go on doing what we're doing.'" Dawla and others say they believe the Egyptian government is also pressuring Said's once-vocal family to keep quiet. Last week Said's relatives fired activist lawyers who were representing them. Activists say the family is also avoiding interviews. Said's brother Ahmed Kassem who had agreed last week to be interviewed by NPR had his phone switched off at the appointed time. There was no answer on his number during subsequent attempts to contact him.